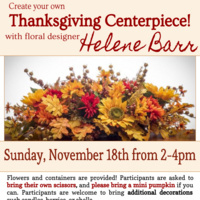 Create a festive centerpiece to adorn your Thanksgiving table with floral designer Helene Barr. Flowers and oval containers will be provided. Participants are asked to bring their own scissors, and please also bring a mini pumpkin if you can. All are welcome to bring additional decorations to include into their centerpieces such as candles, berries, or even seashells. Sign up is required.